Once upon a time in the year 2006. The millennium bug was long forgotten, the world economic crisis far in the future and Apple was just a company producing computers for designers (the iPhone was not on the market yet). And since there were no smartphones or cloud services, no meeting management app was invented yet. At the same time somewhere in the Startup City of Berlin (also not yet at that time), a group of friends was finally so annoyed about another week of f*** unproductive meetings, they decided to take the problem, or rather the solution, in their own hands. We decided to invent the Y.A.M. meeting management app (okay, the term “app” was also not in use yet) to fight all unproductive meetings. We were young, innocent and naïve but had the noblest of intentions … and we had a name for our meeting management app: YAM, which stood for “yet another meeting” – fight fire with fire! At first we have put our heads together and collected all issues that annoyed us about meetings: too many, too long, too large, too out-of-focus, too whatever … and then we designed a technical solution for every single one of them. 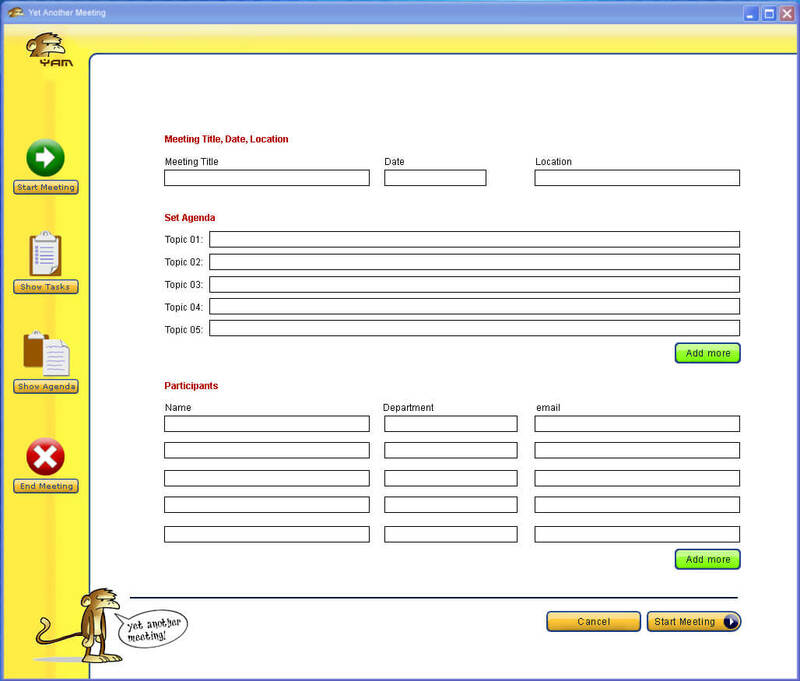 And the outcome was, tadaa, technical wireframes and a click dummy for a meeting management application. And since it was the time of on premise software and cloud and software-as-a-service was rather voodoo stuff (and in addition Microsoft just confused the market with Windows Vista), we were faced with the problem of how to develop our meeting management app (sorry, I mean meeting management software, of course). But developing a meeting management application that should work on all different operating systems, like Windows and Mac and whatever people were using at that time, just killed the budget and forced us to bootstrap. And even worse, limitations in software development were so strong and possibilities in UX so limited, we ended up with an ugly piece of software with an all technical focus. The only design gimmick, we kept in our meeting management app was the “YAM monkey”. By the way, that’s why some of our (to be honest, not so many) users thought YAM stood for yet another monkey. Through mass testing of our meeting management app we were able to discover flaws in our own process design and could do much better next time. We had a working meeting management app on which we could observe real live customer’s behavior. Furthermore, we used the meeting app ourselves in our meetings gathering qualitative insight in what needs to be different. And finally, we were able to generate new ideas for features to improve the overall user experience. We have built up over 12 years of experience thinking about the perfect meeting management app, tossing ideas around and discussing it with real users. And as time goes by, we profited from new technologies and open eco-systems, being now able to do things the way we would have preferred to – like integrating our meeting management app in existing workflows in an office (or rather in Microsoft Office). With our meeting management app for Office 365 and Outlook 2016, the journey hasn’t ended for us. We are super curious what the next 12 years of meeting management produce – and what people produce more using our meeting management app in their daily business. Stay tuned. Next PostMeeting madness - can you believe this? !